Cohering the Vacuum: Making Gravity in Biology- The PATH WITH HEART! "Serious physics AND serious spiritual evolution: - The Heart's Fractal Electrification - IS physics creation principle ( how to compress well ) for what symmetry COHERES the vacuum - & MAKES gravity ! " Connection Serial -COM: (RS-232 or "modem") port. Notes on COHERING THE VACUUM IN THE BODY..-Self Empowerment from the principles of Physics! co·here -v. co·hered, co·her·ing, co·heres, v. intr. - 1. To stick or hold together in a mass that resists separation. 2. To have internal elements or parts logically connected so that aesthetic consistency results: "The movie as a whole failed to cohere" (Robert Brustein). v. tr.- To cause to form a united, orderly, and aesthetically consistent whole. Serious physics AND serious spiritual evolution: - The Heart's Fractal Electrification - IS physics creation principle ( how to compress well ) for what symmetry COHERES the vacuum - and MAKES gravity. We suggest: perfect coherence is fractal because perfect coherence is only the result of perfect compression , and the perfect fractal is optimized by Golden Ratio. This provides a serious theoretical backdrop not only to providing the Golden Ratio feedback cue in brainwaves to teach bliss and creativity and even enlightenment (BlissTuner teaches brainwaves to cohere the charge vacuum). But ALSO to helping us understand how creating matter (charge compression) out of light - HAPPEN INSIDE US. This IS self-empowerment, speaking from the heart! .. This is may be a good time to ask: Did the First CRISIS IN COSMOLOGY CONFERENCE - http://www.cosmology.info/2005conference/ - actually figured out WHY there is a CRISIS in cosmology? Cosmology will NEVER know the source of MAKING GRAVITY - and therefore what holds worlds together - UNTIL they discover the principle of the ELECTRICAL SYMMETRY TO COHERE THE VACUUM INSIDE BIOLOGY! (measuring life force as charge compression: goldenmean.info/biophoton ) . This is why the ancient saying is correct in physics: Stars quiver and are born at the moment of the birth of NEW COMPASSION. The REASON is because compassion (cohering the vacuum using compression in EKG ) is identical with the compression - which MAKES GRAVITY! The difference between vacuum and charge compression, is the difference between matter and nothing, AND life and death. The seed dies and your ekg dies without the ability to radiate charge. This ability to COHERE the vacuum is essential to both matter AND life creation. The symmetry of what would invite the vacuum to compress is precisely what invites it to cohere. This should provide the matrix to invite us to understand to create and support life, by providing our living environment a geometry for charge that INVITES this compression. The reason for example the space in a church FEELS sacred, is precisely because the surrounding CHARGE environment has been arranged into invited compression. This is why it is so critical to understand what electrically constitutes life. We must see that what symmetries permit (charge) compression are what allow DNA to feed, seeds to germinate and bliss to happen. Ultimately - we suggest this BLISS or charge cohering compression experience is the ONLY electrification capable of sustaining / immortalizing the field effect of DNA.. key to electrical passage thru death .. and therefore - key to eternal life! It is not too much of an academic twist to think of "charge" as being the fundamental stuff of matter. That is, "charge" in the broadest sense, not necessarily electron or proton. In our science which we call Vacuum Coherence Physics (VCP), "charge" is understood as the measurable result of coherence among vacuum fluctuations. "Vacuum" here is not identical to the material void among stars, neither to the "ether" (whatever that means anyway in common understanding), as these are all still aspects of material density. Vacuum in VCP is the physical / mathematical space alltogether underlying density, and at the same time complementary to it. This 3D manifestation of vacuum coherence has initially a projective function, that is, it projects "charge". 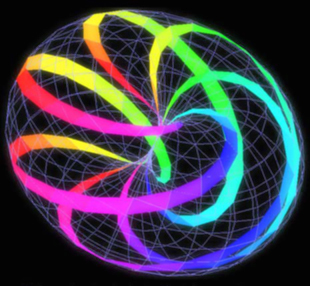 The typical shape of charge in this pre-material 3D form is toroidal, in particular a mathematically well-defined toroidal surface topology, also explained as a dimpled sphere. In this "virgin" state, charge is still ideally embedded inside its envelope of 3D projective vacuum fluctuations, and is hence a still rather theoretical transformation of it. The basic (topological) physics of the toroid is spin-coherence of a toroidal spin plus a corporeal spin, which is simply the projected result of the Phi-based symmetry operations. These two spin aspects are in 1:2 ratio resp., which is consistent with electron internal vs. orbital spin ratio. But besides this still rather theoretical transformation of vacuum physics, there is also an actual operative principle at work. This operative principle is the fact that charge is given the certain degree of liberty to engage in its own phyics. This physics has (in retrospect) an externalising or objectifying effect and is the efficient cause of the cognitive, material world, both cosmology and, when complexity emerges, biology. The primordial symmetry operations are the substantial cause. In atomic physics, the substantial cause and the efficient cause are only in theory discriminable. In the inter-atomic world, as a result, two complementary physics spaces are engaging in an eternal dance: the essential Vacuum, with Phi-ratio based symmetry physics, and the material world controlled by power physics (energy, entropy etc.). Charge, being the communal device among them, is thus migrating through the realms of Vacuum and Density. The mutual interaction and charge-distribution among these two emergent physical spaces is understood to be essentially fractal. The essential dynamics inbetween is intuited e.g. as "implosion" (Dan Winter) or more or less scientifically described as "curvature" (Einstein). This space-warp may also quite conveniently be explained as a combination of pure (vacuum-) accelleration which is the result of the geometry of the vacuum (a logarithmic tranformation) plus a hyperbolic transformation which turns accelleration into emperical gravitation. Hence, according to Global Scaling Theory (GST), the matter / space continuum is a logarithmic-hyperbolic fractal. GST however fails to point out the underlying physics, therefore it is rather a system than a theory. The way round, if such or a similar fractal is set up technically in the proper way, this might introduce a tunnel or wormhole into the physics of the vacuum, resulting in e.g. gravitational or time warp effects and at the same time psychotronic or psychokinetic effects. Mono-atomic gold ("ormus" etc..), having the ideal internal atomic symmetry (completed subshell) is reported to have such exotic effects. Quite a bit of theory is available right now which is increasingly well defined in actual math and physics and is at the same time wonderfully coherent with eastern intuitional sciences as well as (classical) esoterics. For example, charge (the toroid) in the projective phase we understand as the result of octaves (powers of 2 geometry) imminent in a Phi-based heterodyned cascade. This amazingly translates into an arithmetic series found in the human heart when it is coherent. 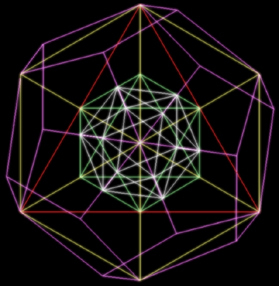 In 3D, these octaves are thought to translate into the cubic alignment in the Phi-based (Icosa / Dodeca) symmetry set, which is know to have 5 spin symmetries ("5 cubes in dodec"). This accounts for the well known "5-spins-inside" of the esoteric atom ("Anu", unitary life). Then, charge in the cognitive phase is encircled by the tetra (understood as the natural co-ordinate system of force alignment in the material world rather than the cartesian system). In dialog with Dan Winter I found that (only) the proper charge-topology of the charge-toroid as discussed before reveals a profoundly hidden 7-fold symmetry when encircled by the tetra, and then only when aligned as prescribed by the Phi-based symmetry set. Through this very special tetra-physics (www.goldenmean.info/tetraphysics) charge is attracted / collected / organised from and within the material plane and then re-installed inside the symmetry set of the primordial vacuum fluctuations. This is understood as the cognitive function of VCP. Summarising: the creation, migration and assimilation of charge through the projective and cognitive phases of the vacuum coherence field is the actual physics of life. Theory: further expanding the plain (non-dimensional) Vacuum Coherence Physics (frequency physics) into 3D symmetry operations and general charge mechanics. Physics: designing, building and testing (fractal etc.) charge devices to employ the vacuum physics for fundamental research and education, as well as for medical, agricultural and technological applications. Frank this is email was the best yet... I highly recommend William Tiller's new books ... His new experiments show this field to be beyond... Zero point or Quantum Field domains but something other, a more basic or ground state of pure Information prior to all energy... this might appear intuitively impossible but many experiments are showing this to be more accurate. The power /information is found/designed into the Randomness or in the Chaos...as pure potentiality/possibilities, the organizing principle is consciousness or simple detection i.e. an electron/photon to another electron/photon. From here classical physics can explain via resonance, wave theory and vortex mechanics. These field states/domains exhibit similarities to those found in a Meissner Field. the effect of the Meissner Field and Superconductivity is called the Meissner Effect: The Meissner effect is the total exclusion of any magnetic flux from the interior of a superconductor. Discovered by Walter Meissner and Robert Ochsenfeld in 1933 and it is often referred to as perfect diamagnetism or the Meissner-Ochsenfeld effect. The Meissner effect is one of the defining features of superconductivity, and its discovery served to establish that the onset of superconductivity is a phase transition. This phase transition of information to info-energy (electromagnetic and other modes of movements of information)is the key to self-organized stuff whether they be tiny subatomic particles or large multicelled organisms. The exclusion of magnetic flux within a superconducting field is brought about by electrical "screening currents" that flow at the surface of the superconducting material and which generate a magnetic field that exactly cancels the externally applied field inside the superconductor. These screening currents are generated whenever a superconducting metal is brought inside a magnetic field. This may be understood from the fact that a superconductor has zero electrical resistance (so the "eddy currents" induced by motion of the metal inside a magnetic field will not decay). However, the screening currents also appear in a situation where an initially normal conducting metal is placed inside a magnetic field, as soon as the metal is cooled below the transition temperature (such that it becomes superconducting). This expulsion of magnetic field on cooling down the metal cannot be explained any more by merely assuming zero resistance. It shows that the superconducting state does not depend on the history of preparation (only on the present values of temperature, pressure and magnetic field), and therefore is a true thermodynamic state. Superconducting magnetic levitation is due to the Meissner effect (which repels a permanent magnet) and flux pinning, which stops the magnet from sliding away. ORMES and as well as other quantum mechanical processes show superconductive characteristics and yes I too feel that it is because of the resonance which produces the geometry of the standing wave of self referencing energy. Resonance before Geometry yet the geometry will produce its own resonance as it phase transitions upward or downward. When the resonance of the standing wave producing and holding the form shifts so does the form. Shifts in perspective, shifts (modulates) the standing wave field. Ultimately(spiritually) when the perspective resides in the higher nonlocal consciousness the form stabilizes or is allowed to dissolve to phase transition to better reflect the new consciousness. I submit that coherence among vacuum fluctuations is very similar to Meissner Effect yet it must have a form of phi/golden mean relatedness to occur in an open system like life. It must have scale invariant characteristics. Coherence electrically is a phasing among frequencies especially in the long ultra low waves which maintain the overall coherency of the form. It's a phasing to a ultra low fundamental at the root of material creation... I submit that for all structures to exist in form-over time (i.e. a standing wave-crystallized phase transition of information/energy) do have at the core phi relatedness...Plank relatedness if you will... but mind erodes, it acts as jitter to break down the coherency of the form and minimize the coherency of the field. Learning the skill to either minimize mind interference or cohere to soul /Heart Intelligence/nonlocal supermental intelligence is the value of the HeartTuner and similar devices. I wish to submit that coherence in the heart reflects either a synergistic alignment of nonlocal mind-heart-and rational mind intelligence which reflects Autonomic Balance which is emotionally felt as peace/calm or other positive emotion... or it may reflect the onset of fixed crystallization which reflects disease and the possible onset of death. 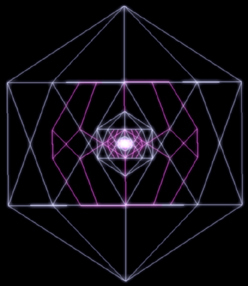 In very rare cases the onset of a unique geometry of coherence produces total enlightenment and a phase transition in the material elements of the body. ... above visualisation uses JAVA Life Graphics 3D - move your mouse over the picture-click to start /stop spin, click & drag to rotate view in 3d! Understanding INCUBUS / SUCCUBUS - ET's over Baghdad - Annunaki's last stand - more info..